Hello everyone! 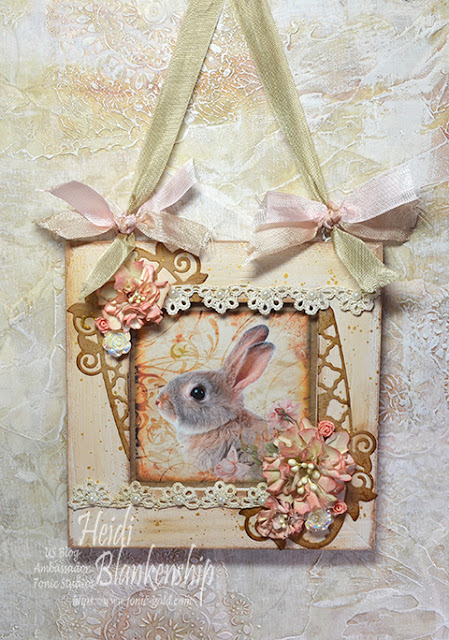 Heidi, here and today I have a fun Spring DIY home decor project to share with you using the Entwining Trellis Plush Peony Die Set from Tonic Studios and also some of the NUVO products. Here is a picture of the plush peony and bunny wall hanging I created for Spring. Since there is no Easter sentiment on the wall hanging you could have this piece hanging up in your home all throughout the Spring season. I started with a small 6 x 6 wood frame. 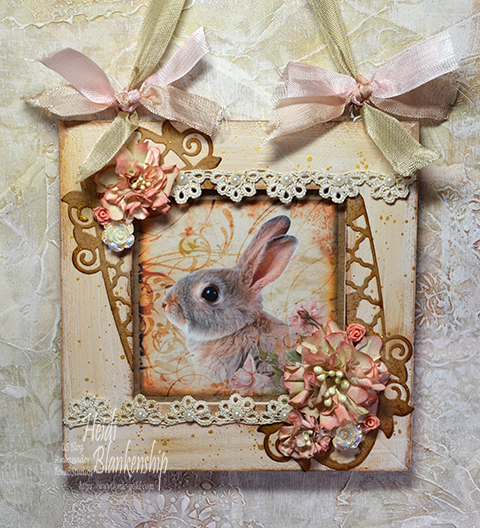 I used a combination of white gesso, Gathered Twigs Distress Ink and NUVO Indian Gold Embellishment Mousse to paint the frame. Then I rubbed a little more of the NUVO Indian Gold Embellishment Mousse on the frame. 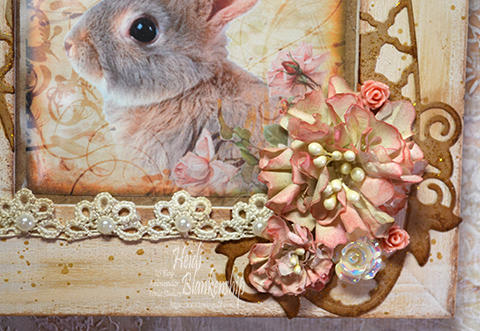 I also added some water to the mousse to create gold paint splatters on the frame. To finish the frame I applied Gathered Twigs Distress Ink around the outer and inside edges of the frame. Next I die cut the large Entwining Trellis border with one of the decorative edges using kraft cardstock. I inked the edges of the cardstock using Gathered Twigs Distress Ink, I placed the die cut in the upper corner of the frame and used some low tack tape to hold the die cut in place and trimmed the excess. Then I used Crafty Tacky Glue to adhere the die cuts to the frame. I did the same thing in the bottom corner of the frame. Here is a close up of the upper corner where you can see one of the peonies I created. I used old book pages (without print) to die cut several of the flower shapes. Then I shaped all of the flower petals and layered the flowers by off setting each layer to create a fuller flower. I used Crafty Tacky Glue to adhere the flowers. Then I used Worn Lipstick and Old Paper Distress Inks to color the flowers and I added pearl stamens to the center of each flower. Here is a close up of the bottom corner. I also added some NUVO Golden Sunset Glitter Drops to the Entwining Trellis border. I just dabbed the glitter drops on with my finger to is would just leave a hint of sparkle. 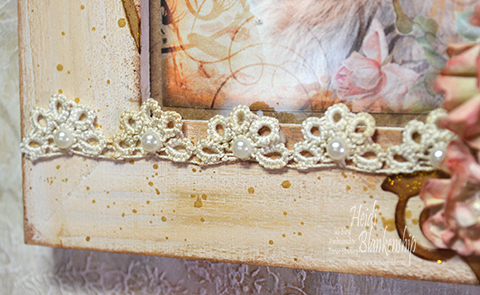 I also added a couple pieces of some vintage tatting lace to the top and bottom of the frame and placed an ivory flat back pearl in the center of each lace scallop. To finish off the flower clusters I added a couple of AB ivory and pink resin roses. Here is a close up of the paint splatters using the NUVO Indian Gold Embellishment Mousse. I added this sweet bunny image from ArtCult to the center of the frame. 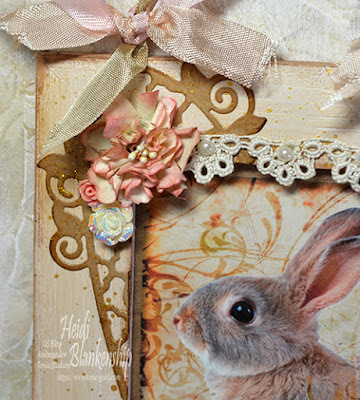 To create the hanger I added baby pink, leather tan, and rose beige seam binding. I frayed the edges of the seam binding to give it a more aged look.